Salt Spring's luxury oceanfront hotel offers old world charm, gourmet food, and one of Vancouver, BC's most wonderful boutique spas on the seaside. Reviewed by Linda Solomon. 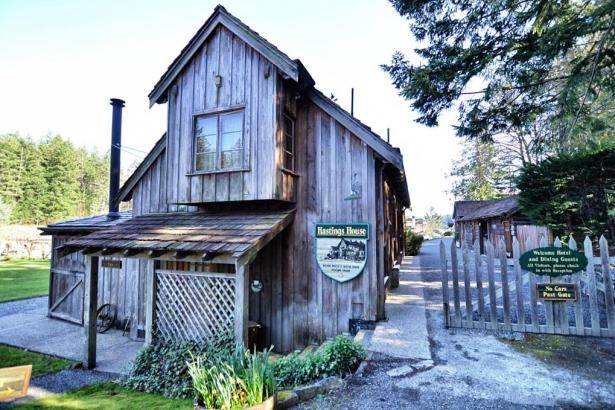 Hastings House on Salt Spring Island in British Columbia offers luxury lodging, fine dining, and old world charm in a gorgeous Southern Gulf Island setting. 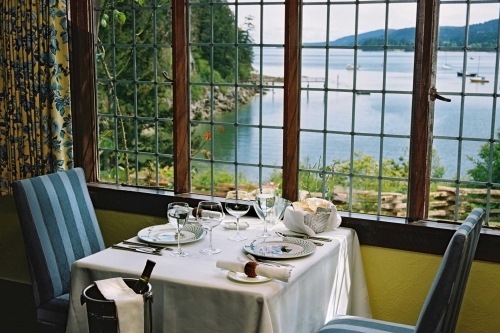 Foodies will find their nirvana in this gem of a country inn nestled in a cove on one of West Coast Canada's most popular vacation destination Islands, accessible by three ferries. An hour and half by ferry from Vancouver's Tsawassen port, this small waterfront luxury country resort with its spa and restaurant, sits on 22 acres on Ganges Harbour in British Columbia. Salt Spring Island in British Columbia is the largest, most populated, and culturally rich of the Southern Gulf Islands. Set against the east side of Vancouver Island, Salt Spring Island is about half way between Nanaimo and Victoria, the capital city of BC. 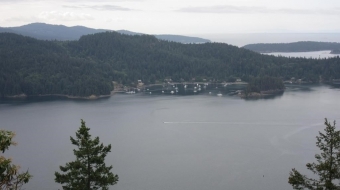 The population of Salt Spring Island is 10,000 human residents and there are said to be nearly 7,000 sheep who are also residents of the rural coastal Canadian island. 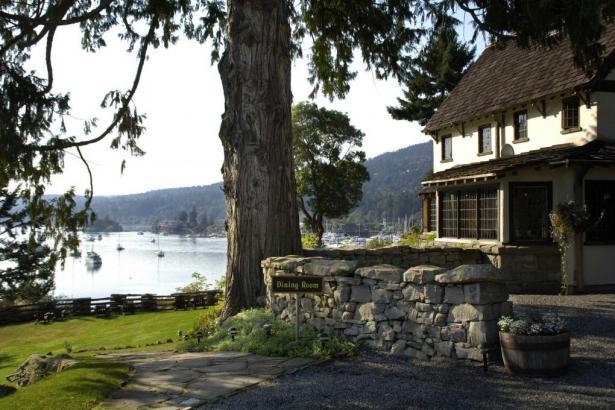 Hastings House is Salt Spring Island's most luxurious accommodation and offers its only gourmet restaurant. The heart of the seaside resort is a beautifully maintained 11th century Sussex-style Manor House overlooking peaceful Ganges Harbour. The Manor House is where guests gather for cocktails and conversation, before dinner and for tea in the afternoon. Eighteen unique guest rooms and suites, each with its own décor and personal history, are situated in seven buildings around the impeccably maintained estate. We arrived at Hastings House on a gorgeous Saturday afternoon on Easter weekend after a magnificent BC ferry ride from Tswassen. Out the ferry windows we saw a pod of killer whales, a rare and exciting site in this area. A short drive from the ferry took us directly to Hastings House, where manager Kelly McAree showed us to a suite overlooking Hastings Houses's well tended garden and orchard. A fire warmed our quaint, cozy living room and fresh cut daffodils and lilacs added beauty to the rooms. After exploring the town of Ganges by foot, we returned to Hastings House for afternoon tea, sitting on the patio in the warm sun and enjoying the view of the harbour and the boats. We then followed the trail through the garden through the woods where a path took past sculptures built by local artists. We relaxed in our suite over a glass of wine, and then went to dinner. In the dining room, a fire warmed the room from beneath a large hearth and out the window, dusk fell over the calm harbour. The dining room reminded me of small restaurants in the French countryside. 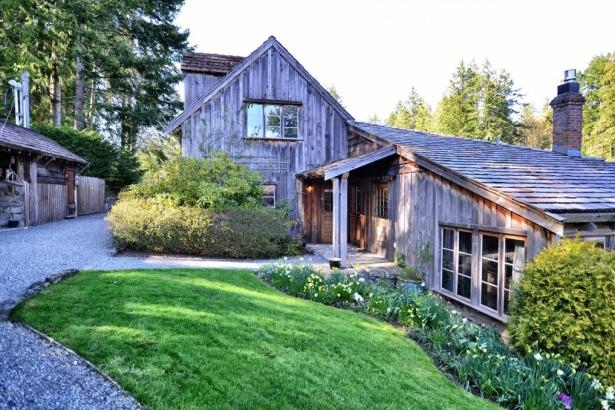 The dark wood floor, heavy beams, and simple rustic charm created an intimacy. Executive Chef Marcel Kauer, Sous Chef Nick Trehearne and Pastry Chef Rosemary Harbrecht prepared one of the best meals I've had since moving to Canada ten years ago. My meal started with duck pate on cucumber and freshly baked bread. Smoked local tuna on organic greens with crispy chalets and extra virgin olive oil came next. My companion started with grilled Tiger Prawns, savoy cabbage and marinated beets. Next came filet of Alberta Beef, with Blue cheese gratin potatoes, in a port wine reduction and Herb crusted halibut, buttermilk potato puree and ginger soya emulsion. We finished with the vanilla creme brûlée and fresh berries and a chocolate truffle. It was a beautiful evening. The grounds threw off the scent of fresh cut grass mixed with the fragrance of blossoming cherry trees and jasmine. In the dusk, the two cottages at the centre of the property looked placidly European, sheep in the meadow and beyond the calm harbour. We slept like rocks. Awakening to a basket of fresh baked muffins, we went back to the lodge and enjoyed a glass of apple cider made from apples grown in the Hastings House orchards and pressed on site. Eggs, bacon, and homemade jam followed. Energized from so much excellent food, we chose from five bikes Hastings House makes available to guests and set off to ride from Hastings House to Salt Spring Island's north end and back. Three challenging hours of grinding up and flying down hills past Salt Spring Island's beaches, farms and waterfront properties, we returned to our cottage and collapsed for a half hour. Then we drove about twenty minutes up to Mount Maxwell Provincial Park view point, a not to be missed feature of Salt Spring Island. From 605 meters, we gazed down at raptors circling above the forest far below, over islands and beyond to the snow-covered peaks of the Olympic Mountains. 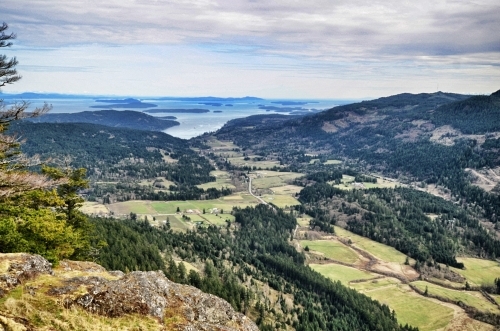 The viewpoint at Mount Maxwell is one of the highest points on Salt Spring Island and is a popular destination for visitors and residents. 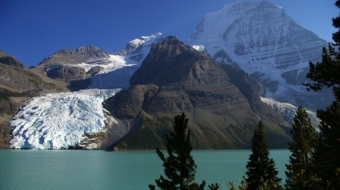 To the west, the mountains of Vancouver Island appeared marvellously clear on the sunny day, and the Southern Gulf Islands and the San Juan Islands sprinkled across the water like pearls. Dinner that night at the Oyster Catcher in Ganges radically paled compared with the Hastings House restaurant meal the night before. Walking back onto the Hastings House property with the garden, the sheep, the scent of flowering trees in the English countryside setting, I appreciated its highly cultivated beauty and unique qualities. Hastings House welcomes visitors from around the world. 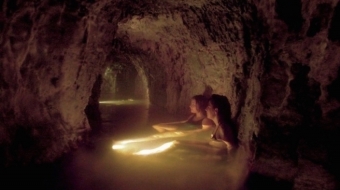 It hosts corporate retreats, weddings and wellness retreats. Awards: Fodors Choice, Zagat: "Top Canadian Resorts", Wine Spectator Award of Excellence, Featured in "1,000 Places to See Before You Die." Rooms from $295 to $595 per night off season. Summer rates start at $395 per night.